There are 167 listings available, you are viewing 1—20. 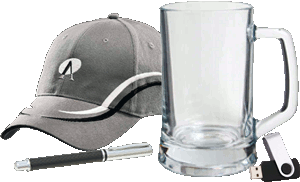 Recyclable 470ml double wall, screw top tumbler with a leak proof flip valve drinking straw. Trendy 400ml cup with double wall construction which will keep coffee hot for longer. It features a smart diamond patterned stainless steel outer wall and a plastic inner wall. Bottle Buddy TPK109758 Zip up wetsuit style stubby holder which fits most stubby size bottles. BPA free 500ml drink bottle which is manufactured from recyclable food safe polyethylene. Round, 300ml, Black D handle stoneware coffee mug. BPA free 600ml drink bottle which is manufactured from recyclable food safe polyethylene. 500ml thermal mug with a tough stainless steel outer wall and a plastic inner wall.